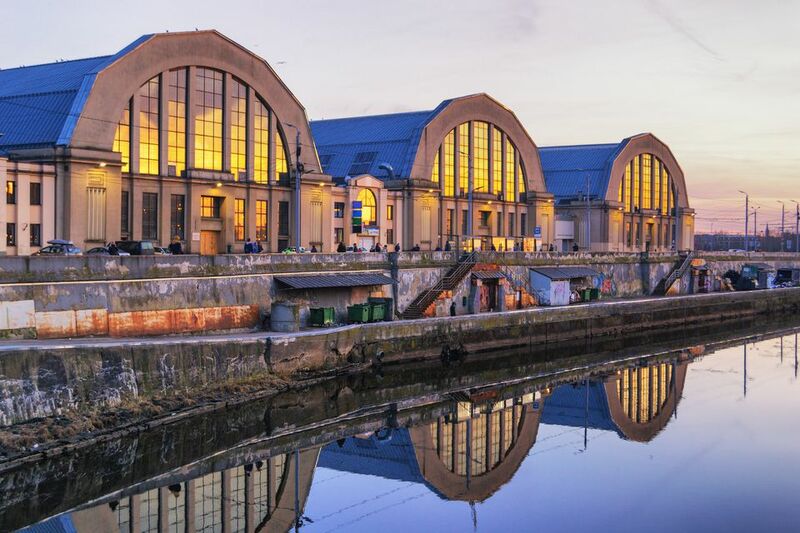 Occupying a series of five WWI Zeppelin aircraft hangars, Riga's Central Market covers a vast floor space and is Europe's largest market. More than 3,000 vendors sell an impressive range of fresh local produce, and the stalls are divided neatly into separate hangars selling meat, fish, dairy, and vegetables. Here's our pick of the best things to eat and buy while you explore one of Riga's must-see sights. The market has a handy location—it's near the edge of the Daugava River, close to Riga's main train and bus stations, and near the city's Spikeri cultural district and holocaust museum. It's also about a 15-minute walk from Riga's pretty Old Town, a designated UNESCO World Heritage Site. There's a whole Zeppelin hangar lined with stalls selling fruit and vegetables and a huge selection of pickles. The stallholders let you help yourself to mounds of crunchy sauerkraut, and you'll find all sorts of produce including carrots, tomatoes, garlic, mushrooms, green beans, cauliflower, and cucumbers flavored with a variety of herbs and spices. Sauerkraut is a Latvian staple and is commonly used in side dishes, dumplings, and soups. You might see locals ordering a glass of sauerkraut juice, which is said to be packed full of antioxidants and good for the digestive system. Although they might not have originated in Latvia, pelmeni are eaten throughout Riga and are definitely worth trying. A cross between Polish pierogi and Italian tortellini, these small dumplings are made with unleavened dough and filled with minced meat, vegetables, or cheese. They can be served in a broth or fried and always come with a dollop of sour cream. Head to Pelmenu Sturitis, a small family-run stall in the fruit and vegetable hall, for a bowl of made-to-order dumplings for around 3 euro. According to locals, it's one of the best places to try these delicious hand-rolled treats. Latvia has close links to Uzbekistan, and there are a number of Uzbekistani restaurants and cafes dotted around Riga. Follow your nose to the Uzbekistani bakery between the halls selling vegetables and fish, and order a non, a traditional round flatbread served fresh from the oven. Be prepared to wait in line as these giant rolls are hugely popular. They're served plain or topped with sesame seeds or cheese and make a tasty, affordable snack for less than 2 euro each. You'll see an incredible array of fresh fish, seafood, and smoked fish on sale at Riga's Central Market, and some of the displays look like works of art. Smoked and salted fish is a big deal in Latvia, and you'll see it on menus throughout Riga. One of the country's best-loved dishes is Liepaja menciņš, a comforting dish made from smoked cod, potatoes, onions, and cream. Pick up some local delicacies to try like smoked mackerel, pickled herring, and smoked sprats in oil. In the dairy hall, you can pick up all sorts of creamy treats delivered fresh from Latvian farms. Try some of the local kefir, a fermented milk drink that's popular across much of eastern Europe for its wide ranging gut health benefits. Most of the Latvian cheeses offered are mild in flavor and are often coated in herbs and spices. Try some of the Mednieku, a smoked cheese with an edible brown layer and Monterigo, a Latvian take on Parmesan. You'll see Biezpiens at every counter. This cottage cheese is served sweet or savory and is sold by the bucket load to be enjoyed on top of rye bread and pancakes and served alongside boiled potatoes and pickled herring. If you're putting together a picnic to enjoy in one of Riga's many beautiful parks (Bastejkalna, Esplanade Park and Kronvalda Park are all highlights), you'll want to stock up on some tasty rye bread. It's said that the average Latvian consumes around 50kg of rye bread per year and tradition dictates that if bread is accidentally dropped, it must be picked up immediately and kissed. Rupjmaize (dark rye bread) is a dense loaf that's served as an accompaniment to most meals alongside herb-flavored butter. You'll see a large selection of bread on offer at the market including Saldskaaba Maize (a delicious sourdough) and a variety of rye breads flavored with all sorts of different nuts and seeds.